It’s just like the classic baked macaroni and cheese, but without the noodles! And you won’t even miss ’em, I promise. While my love for pasta is strong and unwavering, I have wholeheartedly jumped on the spaghetti-squash-in-place-of-actual-pasta bandwagon. Sometimes you just have to swap out the carbs for some veggies. It makes for more calorie wiggle room for cookies, which is such a nice bonus. So every so often I “healthify” one of our regular pasta dishes with spaghetti squash, and I have yet to hear complaints from my husband or picky toddler. My latest experiment? This twice baked spaghetti squash and cheese. And we gobbled it up! All I did was take a classic mac and cheese recipe and sub baked spaghetti squash for the noodles. The sauce is the same, and so is the breadcrumb topping. While I admit it’s not as indulgent as the original, you really won’t miss the pasta. It’s still creamy, cheesy and cozy. All the things that macaroni and cheese should be. 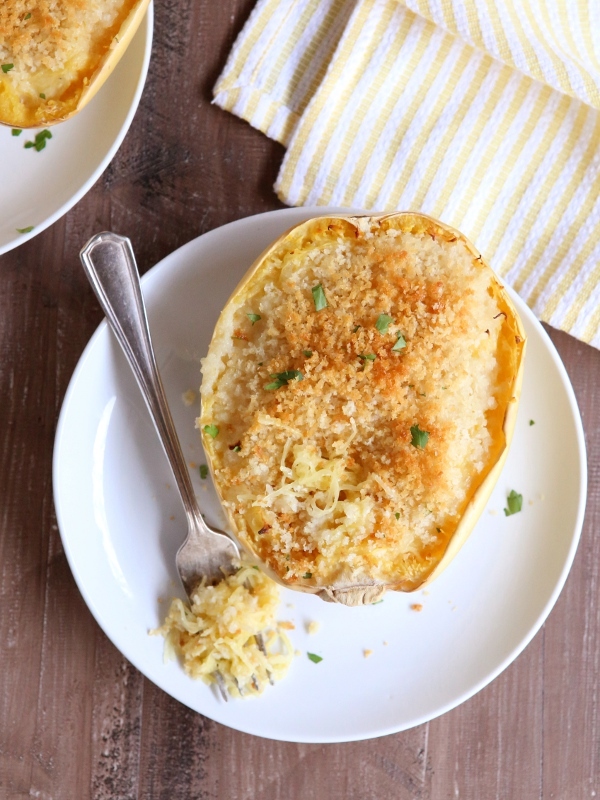 You could serve this spaghetti squash and cheese as a simple (and vegetarian) dinner for two, or keep it as a side dish alongside a protein like pork or chicken. And a quick note, because I’ve gotten a lot of comments on this— it’s not a “low carb” dish! Definitely a little lower in carbs since I’ve nixed the pasta, but not “low carb”. This dish, and most mac and cheese recipes, start with a roux-based sauce made from whisking milk into a flour mixture. The wrong way to do it: Dump all the milk in quickly, whisking a little or not at all. This will result in a lumpy sauce that won’t thicken properly. The right way to do it: Add a little milk to the pan to start and whisk until it is fully incorporated into the flour. Do this a few more times until the mixture starts to look like a sauce, whisking until there are not lumps. Slowly pour the rest of the milk while whisking constantly. It will take more time, but you’ll end up with a smooth and creamy sauce. How to save a lumpy sauce: Mix in a blender until smooth. Return to heat and stir until thickened. 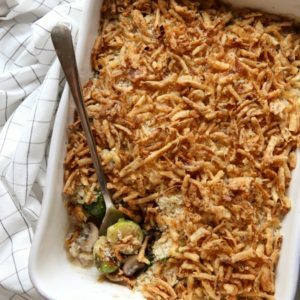 Just like traditional baked mac and cheese, but without the noodles! 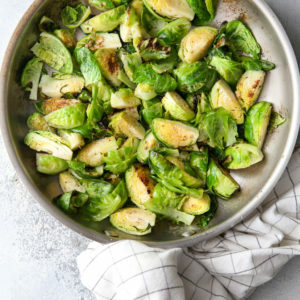 Makes a great light meal or side dish. Preheat oven to 375 degrees F. Line a sheet pan with parchment paper. 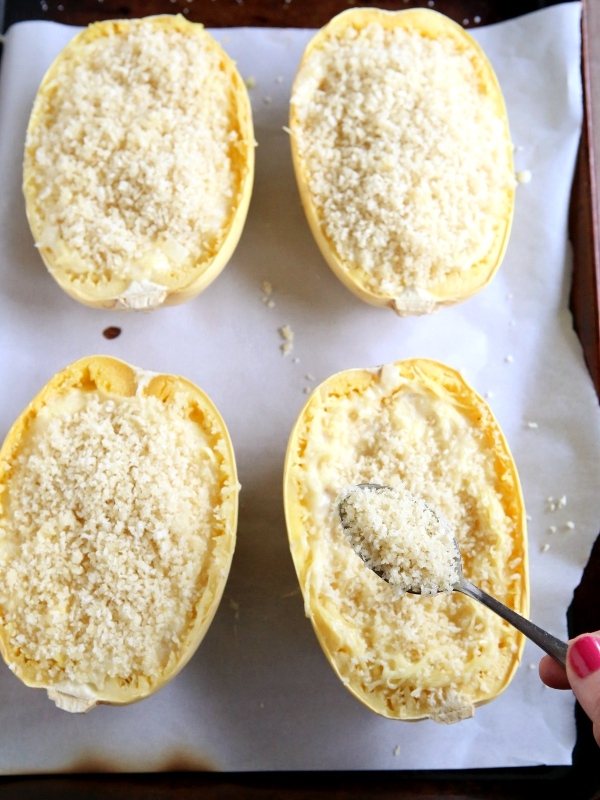 Place spaghetti squash on parchment, cut side-up and sprinkle with salt. Cover with foil and bake until fork tender, about 1 hour. Let spaghetti squash sit a few minutes until cool enough to handle, then shred flesh with a fork. Transfer squash flesh to a large bowl and set aside. Reduce oven temperature to 350 degrees F.
In a large skillet, melt 2 tablespoons of the butter. Add the onion and cool until translucent, about 5 minutes. Add flour and mustard powder and stir with a whisk until it makes a thick paste. Slowly pour the milk into the pan while whisking constantly. Bring to a boil, then cook for a few minutes until thickened, stirring frequently. Add the cheddar cheese, salt and pepper and stir until smooth. 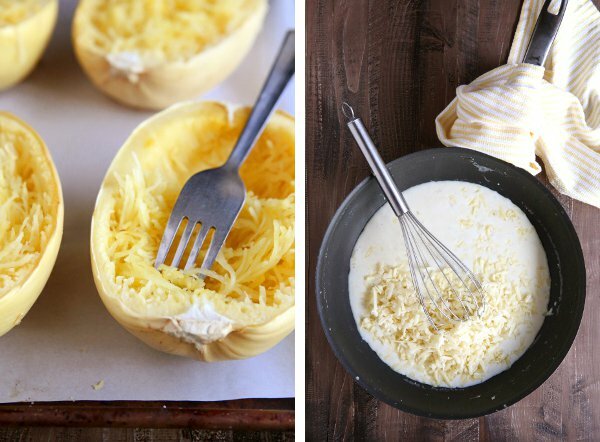 Pour the cheese mixture into the large bowl with the spaghetti squash and toss until combined. Divide evenly into the 4 squash skins. Melt the remaining 3 tablespoons of butter. Add the panko bread crumbs and stir until all the bread crumbs are moistened. Sprinkle on top of the spaghetti squash. Bake until filling is bubbling and topping is browned, about 30 minutes. Serve immediately. Total genius!! 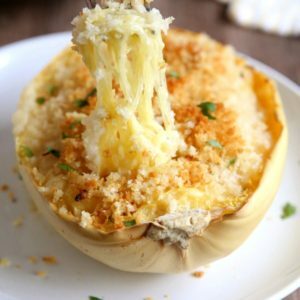 Baked spaghetti squash is good, but twice baked?! YES! What is step number 4? Thanks. This looks delicious! I have yet to try spaghetti squash in place of pasta but I’ve been wanting to for a while. This looks like the perfect recipe to start with! 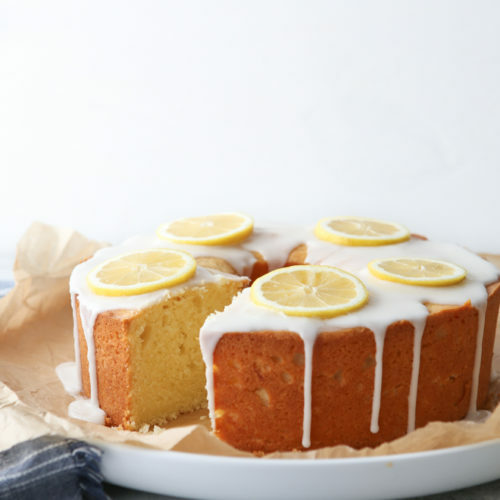 This recipe definitely fits your site – it looks completely delicious! Love your cream cooking tip in the middle too! Amazing! This is SUCH a beautiful recipe!! Oh my gosh this looks heavenly. I want oodles and oodles of this spaghetti squash!! Oh yum. Just made this and it is amazing!!! Thank you. Made this tonight. Added sautéed kale and garlic when mixing in the bowl. Turned out excellent! Loved it! Will definitely make this guilt free Mac and cheese again! 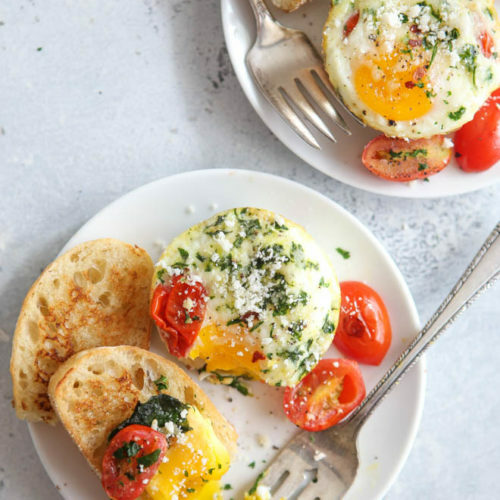 Love the idea of adding kale and garlic – yum! Just made and it is delicious!! I’m so glad! Thanks Lisa! Hello! Do you know the nutritional values for this recipe??? I don’t calculate any of that info, sorry! I calculated it at 275 calories/ 18 carbs per cup. My recipe made 8 cups. I have diabetes. I know this isn’t 100% carb-free. But what I really need is the protein content. It looks low. I may try this using my regular mac n cheese recipe instead of the roux. I’ll let you know how it turns out. Wish it had nutrition facts to check out….as I’m trying to stay on low card eating…..
Looks great but I need nutritional information. You can also cook spaghetti squash in the microwave. Cut squash in half lenghthwise , remove the seeds. place in glass baking dish, pulp side down and add about an inch of water. Cook in microwave on high for twenty minutes. Some recipes say to put olive oil on the on the pulp side. I don’t and it always comes out great. Saves you 40 minutes of cooking time compared to baking in the the oven! The recipe says cool the onions 5 minutes until translucent. I think it should be cook not cool. You Say its lower carb but there is no nutritional info. Without that info it could be 6000 carbs as opposed to 60000. Neither of which I want to consume. 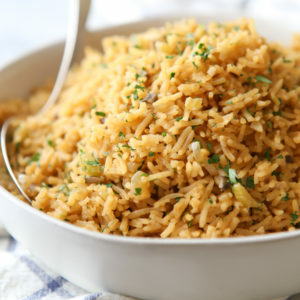 It’s a LOWER carb meal simply because it’s using a veggie instead of pasta, but this dish is not “low carb”. I’m working on adding nutritional info to all of my recipes, but it’s not an easy task. In the meantime you are welcome to plug the recipe into any free online nutrition calculators! Panko bread crumbs, onions, milk. Even without nutrition facts I know this won’t be “low carb” enough for my diet. Yep, this is definitely not “low carb”. Maybe a little lower in carbs since there’s no pasta, but I have not labeled it “low carb”. Sorry this won’t work for you! Made this recipe tonight and it was delicious! Can’t wait to bring it for lunch to work tomorrow. I didn’t have any panko breadcrumbs so I used seasoned Italian. I think the panko would be better so will make sure I have it next time I make this. Thanks for the recipe! Hi Teri! Thanks so much for the comment, I’m happy to hear you enjoyed it! What are the Weight Watchers SP on this please?? It looks delicious, spaghetti squash is new to me and I love it! Always looking for new ways to prepare it. Thanks..
Wow! I calculated it out and if I divide it into 4 servings and use 1% milk, it works out to roughly 20 Points a serving! I think NOT! Yay! So happy you loved the recipe. This is a family favorite! Its soo yummy! No need to worry about ” not low calorie/carb” if you dont like it choose healthier substitutes or just dont make it! 🙂 I used almond flour and skim milk and cornflakes instead of bread crumbs. I highly recommend this recipe! It will be 2 meals for myself and my husband. I added up to be 332 calories for of 1 half of squash. Thanks so much for the recipe!!! Wonderful! Thanks so much for the feedback, Michelle! Yes I think that should work fine! Love spaghetti squash anyway. Always looking for new ways to prepare them. I’m not fond of cheddar, so I substituted cold-jack cheese. Mmm, mild but still cheesy. Delicious!…My oven is going to be pretty full this Christmas Eve. 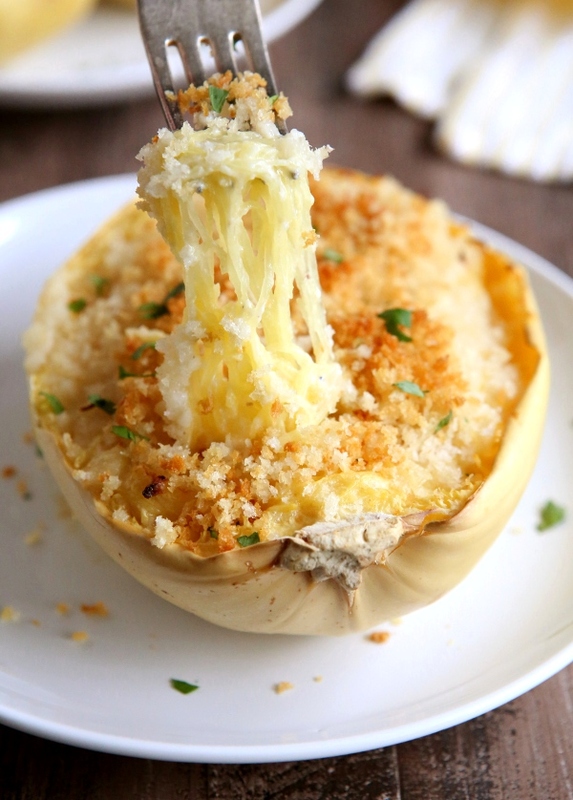 I want to make this for Christmas Eve dinner and was wondering if twice baked spaghetti squash. I just made this and was curious about the calories as well. Putting the ingredients into a calculator, it comes to 560 calories for 4 servings. Which isn’t that bad. It’s def not low calorie. The 5 tablespoons of butter don’t help lol. But I added broccoli and it’s a nicely indulgent meal. Thanks! Yes, this is not a low calorie meal. 🙂 But it’s lower than if you used pasta and I like the extra dose of veggies.